Yo, Taylor, I’m really happy for you — I’mma let you finish — but Beyoncé had one of the best videos of all time! One of the best videos of all time! Swift denies she’ll be releasing new music in October, even though that would have kept her on the schedule she’s maintained ever since she first released her self-titled debut. A U.S. Disctrict Court judge in California dismisses the ‘Shake It Off” lawsuit , using Taylor Swift’s own lyrics. Jesse Braham (aka Jesse Graham) had claimed that the phrases “haters gonna hate” and “players gonna play” were plagiarized from his 2013 song “Haters Gonna Hate.” But the judge found that the phrase “haters gonna hate” was already a meme and a popular item in Google searches before Braham’s song debuted, according to evidence cited in the ruling. That’s to say nothing of the seminal 2000 track “Playas Gon’ Play” by 3LW, which the judge also cites. At present, the Court is not saying that Braham can never, ever, ever get his case back in court. But, for now, we have got problems, and the Court is not sure Braham can solve them. As currently drafted, the Complaint has a blank space— one that requires Braham to do more than write his name. And, upon consideration of the Court’s explanation in Part II, Braham may discover that mere pleading BandAids will not fix the bullet holes in his case. At least for the moment, Defendants have shaken off this lawsuit. Out-of-work musician, Jesse Braham, is suing Taylor Swift for $42 million, claiming she ripped off his lyrics for her hit song ‘Shake It Off.’ He claims that his song, ‘Haters Gone Hate,’ has the same phrases that Swift used in her song and that he copyrighted ‘Haters Gone Hate’ in February 2013. Swift’s song, from her 1989 album which she released in 2014, has the lyrics: ‘Cause the players gonna play, play, play, play, play. And the haters gonna hate, hate, hate, hate, hate’, as well as ‘And the fakers gonna fake, fake, fake, fake, fake’. The suit includes a YouTube link to ‘Haters Gone Hate,’ sung by a Jesse Graham, which was posted in December 2013. It has 76 thumbs up, and 1,046 thumbs down from those who listened to it. The melody is different from Swift’s song. At the final leg of her U.S. tour, in Tampa, Swift performs Let It Go with Menzel dressed as Olaf the snowman. Frozen totally happened tonight. And 55,000 people sang ‘Let It Go’ so loudly, it nearly took my breath away. Swift’s Blank Space‘ video reaches more than 1.3 billion views, meaning, she is the most viewed on VEVO. In a ten-minute acceptance speech for the Video Vanguard Award at the VMAs, West apologizes to Swift for grabbing the mike from her in 2009, and announces he will run for president in 2020. If I had to do it all again, what would I have done? Would I have worn a leather shirt? Would I have drank half a bottle of Hennessy. If I had a daughter at that time would I have went on stage and grabbed the mic from someone else?..After that night the stage was gone, but the effect it had on people remained. The problem was the contradiction. The contradiction is I do fight for artists, but in that fight I was somehow disrespectful to artists. I’m confident. I believe in myself. We the millennials, bro. This is a new mentality. We not gonna control our kids with brands. We’re not gonna teach low self-esteem and hate to our kids. We’re gonna teach them that they can be something. We gonna teach our kids they can stand up for themselves, believe in themselves. It don’t matter though. It ain’t about me. It’s about ideas, bro! New ideas, people who believe in truth. And yes, as you probably could’ve guessed by this moment, I have decided in 2020 to run for president. Swift releases the video for Wildest Dreams at the VMAs, directed by Kahn and starring Swift and Eastwood in an African-themed romance. Kudrow sings Smelly Cat with Swift on stage at Staples Center, Los Angeles. This singer has only ever played in coffee houses before. She never played in a big venue like this. Please make her feel welcome. You guys, her name is Phoebe Buffay. Timberlake joins Swift, during her LA show at Staples Center, for a performance of Mirrors. Justin hasn’t performed since he became a dad, so I’m just honored that this is his first performance. She inspired a generation of confessional female singer-songwriters who all of a sudden felt like you could actually say these raw feelings that you had. You could actually sing about your real life, you could put detail to it, you could get really, really made if you wanted to. And I think it’s fair to say that so many of the female singer-songwriters of my generation, including myself, would not write the way that we do without her and her music. And she has written some of the most brilliant music – in particular probably inarguably the greatest breakup song of all-time. Swift introduces DeGeneres during her performance of Style, at the Staples Center in LA. DeGeneres dances and sings the song with Swift, in an almost identical sparkly outfit..
Los Angeles, please make some noise for international pop superstar, Ellen DeGeneres. We even have girls in our group who have dated the same people. It’s almost like the sisterhood has such a higher place on the list of priorities for us. It’s so much more important than some guy that it didn’t work out with. When you’ve got this group of girls who need each other as much as we need each other, in this climate, when it’s so hard for women to be understood and portrayed the right way in the media. Swift talks to Vanity Fair about how Jay-Z helped her heal the relationship with West. I feel like I wasn’t ready to be friends with [West] until I felt like he had some sort of respect for me, and he wasn’t ready to be friends with me until he had some sort of respect for me—so it was the same issue, and we both reached the same place at the same time,” Swift says. “I became friends with Jay Z, and I think it was important, for Jay Z, for Kanye and I to get along. . . . And then Kanye and I both reached a place where he would say really nice things about my music and what I’ve accomplished, and I could ask him how his kid’s doing. During a concert in Edmonton, Canada, an male fan tries to grab Swift’s her leg during Bad Blood. She jumps back, glares at him, and calmly headed back to the main stage. If you look at Oprah, she’s made so many people happy over the years. She’s made so much money, but she’s given so much of it away. . . . Same thing with Angelina Jolie. She’s been so productive, but she’s used that position to better other people’s lives, and I think that’s where I’d want to be. That was the way that I decided to go on with my life. Not looking for anything, not necessarily being open to anything, and only being open to the idea that, if I found someone who would never try to change me, that would be the only person I could fall in love with. Because, you know, I was in love with my life. I think I know how to put together a good outfit. . . . But any day you’re going to admit to being a style icon is a day you need to look in the mirror and really check yourself. They’re planning a trip to the UK with a few days in Scotland so she can meet his parents…This is the real thing. Taylor spent a long time being single, waiting for the right guy like him…Her parents love him. They think he’s the greatest. Swift and Minaj trade comments on Twitter due to Minaj being not nominated for a VMA for Anaconda, while Swift was nominated for Bad Blood. Jonas posts an Instagram of his duet of Jealous with Swift at Swift’s 1989 concert tour at the MetLife Stadium. Swift donates $50,000 to the GoFundMe page of Naomi Oakes, a leukemia patient, in response to the eleven year old adopting Swift’s Bad Blood as her theme song for her hospitalization video. To the beautiful and brave Naomi, I’m sorry you have to miss it, but there will always be more concerts. Let’s focus on getting you feeling better. I’m sending the biggest hugs to you and your family. Responding to Swift’s comments, the company agrees to pay artists during the three-month trial period. In the note titled To Apple, Love Taylor, Swift criticizes Apple Music’s free three-month trial for users, a period of time in which the service will not compensate artists for what is streamed. …Three months is a long time to go unpaid, and it is unfair to ask anyone to work for nothing. I say this with love, reverence, and admiration for everything else Apple has done. I hope that soon I can join them in the progression towards a streaming model that seems fair to those who create this music. I think this could be the platform that gets it right. Swift premieres the music video for Bad Blood (featuring Kendrick Lamar), at the Billboard Music Awards, the fourth single from her #1 album 1989. The elaborate video features Swift as a leather-clad revenge-driven hero dubbed “Catastrophe.” Many of Swift’s famous friends appear in the video, with Gomez playing Swift’s arch-enemy, “Arsyn.” The song is rumored to be about the rift between Swift and Katy Perry. Swift appears on the cover if June 2015 issue of Glam our UK. She talks about how she manages to stay grounded despite her fame. I think that part of me not going crazy is me admitting my life is weird and not normal… My [mom] is really good at putting things back into perspective for me. And it’s really nice when she says, I know there’s no way I could possibly understand what you’re going through, but here’s what I think. Swift performs Blank Space during the Brit Awards show promoting her album 1989. When he stayed over at Taylor’s L.A. house . . . Calvin says he was up all night blowing his nose and complaining he couldn’t breathe. Apparently he’s allergic to the long fluffy hair on Taylor’s cats and they usually sleep in the bed so it’s everywhere. For many years, I was her constant companion. And I witnessed a young girl with very few friends become one with many, learning to stand up for herself and the things she believes in. Being brave enough to explore her musical curiosity, having a voice against those who hate, and giving of herself to those in need. I am a very proud mom. I want to thank the entire music community for taking such good care of her. And to the fans: I know you love her as I love her. And for that, I thank you eternally. Swift declares her support for her 57-year-old mom who is battling cancer, and reminded fans to look after their parents. I’m saddened to tell you that my mom has been diagnosed with cancer. Usually when things happen to me, I process them and then write music about how I feel, and you hear it much later. This is something my family and I thought you should know about now. Taylor once thought she loved Harry, but since getting to know Calvin [Harris], she’s realised that Harry was never really more than a crush. The relationship was not nearly as serious as she thought it was at the time. Taylor was more than happy to delete Harry’s number. Calvin’s made her realize that boys like Harry are toxic for her and given her the confidence to cut him out of her life for good. She’s determined to show Calvin she’s serious about him and wants him to feel as secure as she does. On Fortune‘s second annual list of the world’s greatest leaders, Swift comes in as the top female leader and sixth overall, just two spots behind Pope Francis. Fortune credits her ability to develop a strong social-media brand and her influence on the music industry. . . .she has proved shrewder at honing a brand in the social media age than virtually any other person or company. And she’s done it without resorting to dumbed-down salacious gimmickry…Swift’s efforts to ensure she gets paid for her music could have a huge ripple effect on the way artists are compensated in an era of free streaming. King names Swift godmother to her second child with Newman. King makes the announcement via a post on Instagram. 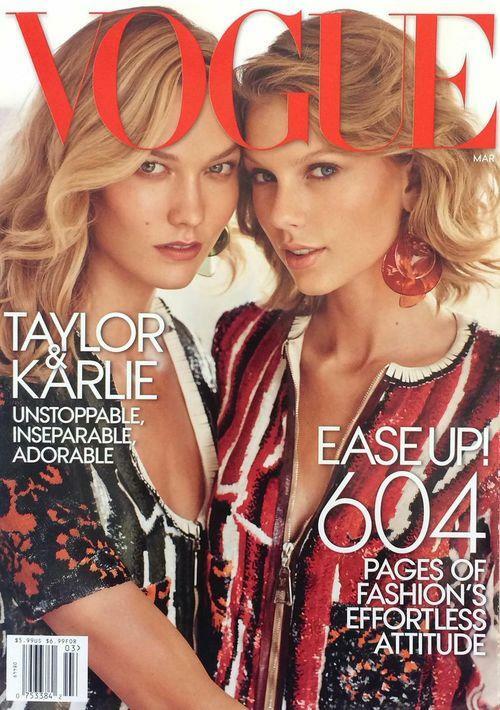 Swift and Kloss appear together on the cover of Vogue. Swift discusses keeping her work life and friends separate. The fun thing about my friends is that they don’t necessarily know a lot about what I do business-wise. We all have to step up and make albums that are good, top to bottom, if selling albums is still important. It is to me, but a lot of artists have already given up on that. I have friends who just think it’s not attainable, which I feel is a very defeatist way to look at life. I used to think it was important to find a boyfriend. I don’t feel that it is now. I just want to have as much fun and as many adventures as possible. I’m not giving them anything to write about, I’m never going to talk about her in my interview. It’s not going to happen…It’s not real if someone appears to never have any issues with anyone. I have my friends. I have enemies. I have bad days when I don’t want to go to a photo shoot, but I’m not going to show up four hours late. I’m going to be there on time. Swift goes out for a late dinner in New York in a pair of vintage inspired tights, accessorized with a tiny black leather and wood handled handbag and a pair of Christian Louboutin black Nappa Mamanouk booties. Swift releases Style, from her album 1989. We should have just called it ‘I’m Not Even Sorry’. Swift’s 1989 album returns to No. 1 on the Billboard 200 chart for a milestone 10th nonconsecutive week, making Swift just the second woman in history to earn two albums with at least ten weeks atop the list (the other being Whitney Houston). Swift appears on the cover of the January 2015 issue of Cosmopolitan China magazine. Swift appears on the cover of the January 2015 issue of ASOS magazine. She talks about needing mistakes to happen, her best friends, and dressing for girls. When I’m getting dressed, it’s always based on what my friends will think. They are my number one priority and the opinions of girls are more important to me at this point in my life. Swift appears on the cover of a December 2014 issue of The Hollywood Reporter. She talks about the reaction to taking her music off Spotify. I didn’t think that it would be shocking to anyone. With as many ways as artists are personalizing their musical distribution, it didn’t occur to me that this would be anything that anyone would talk about. Walters interviews Swift about her good girl image and the responsibility she feels to her fans. Well I do drink, I’m 25. But I did wait until I was 21 because I was worried about getting into trouble. I put everyone of my actions through a filter before I do them because that’s the way my life is. If that story gets out or some 10-year-old sees that I did that in a news article, like my actions do have ripples. Swift wins billboard woman of the year award for the second time in a row. During her acceptance speech Swift had this to say. I turn 25 at midnight tonight, and I fully intend to celebrate like it’s 1989. I knew it was a bad joke when I wrote it, and I just did it anyway. Events like this where we have the most powerful people in music all gathered in one room, events like this give me hope that the right conversations will start to take place, and I invite you all to join in the conversation. The greatest moment of the year for me was when my fans went out and proved that if you provide them with a bold statement and pour your life into an album, they’ll buy it.